The SSB 2015 maps out strategies for Singapore’s sustainable development, and sets out a collective vision for a Liveable and Endearing Home, a Vibrant and Sustainable City and an Active and Gracious Community. The Sustainable Singapore Blueprint (SSB) 2015 has made good progress since its launch by Prime Minister Lee Hsien Loong in November 2014. Mr Masagos Zulkifli, Minister for the Environment and Water Resources said at the launch of the Clean and Green SG50 (CG SG50) that “the Sustainable Singapore Blueprint (SSB) has made progress since its launch last year. The progress can be credited to the collective interests of Singaporeans in caring for our environment. SSB is a journey, not a destination. The SSB, which was first released in 2009 aims to meet targets by 2030. Much has been done over the course of 2015 to develop the 5 focus areas. “Eco-Smart” Endearing Towns, work is ongoing to embed smart technologies and eco-friendly features into towns and homes. Progress has also been made to enhance green and blue spaces for Singaporeans to live, work and play in. For a “Car-Lite” Singapore, enhancements to rail and bus networks are underway to improve the public transport experience. Measures are also being taken to promote cycling as well as to improve walkability in public spaces. Under the objectives of Towards a Zero Waste Nation, initiatives are being implemented to improve the management of waste streams such as food waste and electrical and electronic waste (e-waste). An example is the upcoming pilots for on-site food waste recycling at Tiong Bahru and Ang Mo Kio hawker centres. To grow a Leading Green Economy, the Green Building Masterplan is being implemented to lead the way for green buildings in the tropics and sub-tropics. Plans are also being implemented to raise the adoption of solar power. The SSB also serves as a call to action for all segments of society to come together and contribute. 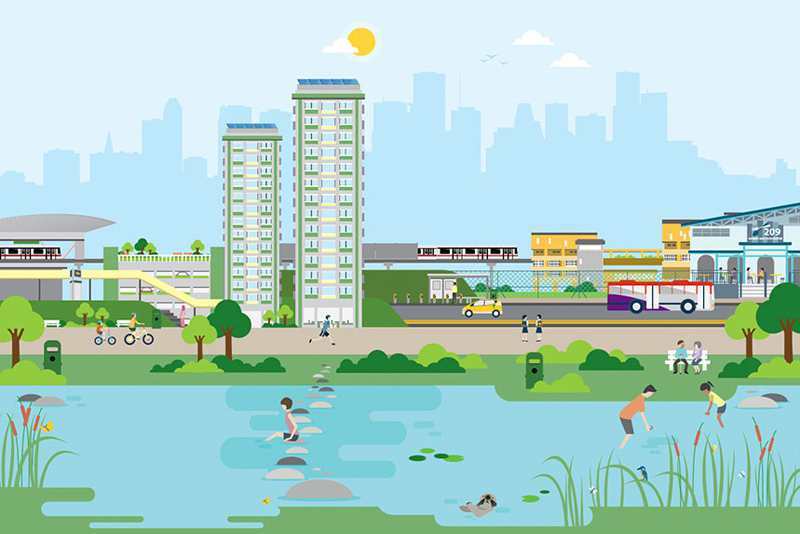 Under the focus area of an Active and Gracious Community, engagement efforts have been underway for initiatives such as the Rail Corridor and the Ubin Project, as well as to encourage community movement through Community in Bloom Gardens.